Homeschooling 8th grade… I don’t know about you, but I’m a bit nervous when it comes to homeschooling during the junior high years. It’s all about preparing them for the high school years -- that means study skills, learning to take notes, and maybe even taking a few high school level classes to get a jump on those high school credits. Before I start clicking ‘purchase’ on our curriculum shopping list, I like to plan my goals for the year. When life gets busy those homeschool goals give us an anchor -- we know what to focus on and what we can set aside for a little bit. This is always one of my first planning steps every year -- don't skip this step in your yearly homeschool planning process! With high school looming on the horizon, my goals are focused on getting my daughter ready for those years. That means focusing on getting her ready for high school level math, working on writing skills, learning to annotate a novel, taking notes from a textbook, and including a few courses that will count towards high school credit. Of course, we'll cover more subjects than what's included on that list, but if we need to modify our plans or adjust anything I know exactly where our focus will stay, even if other things need to change. Once I've worked out our goals for the year, it's time to start buying our books! We’ve been homeschooling since the beginning and I can honestly say it gets easier every year. Every year is different but, when we find what works, we stick with it -- and that makes shopping for homeschool curriculum easier every year. Math-U-See is a video-based curriculum that covers math from kindergarten through high school. We used a different program for the elementary years but I wanted something video-based for high school (since I don't want to teach math at this level!). It's a thorough program and works well for us. The Discovery of Deduction is the next step in our Logic studies. We've covered informal fallacies and logic puzzles over the past few years and we're ready to move onto formal logic with this program. We are taking our time and discussing each section during our morning meeting time. We're getting a head start on high school credits with French this year - Breaking the French Barrier is a high school level self-study program (we're both using it though, and learning French together). To cover all the language arts bases, we're using Rod & Staff English for grammar, Writing & Rhetoric and Writing with Skill for writing, Megawords for vocabulary, and Windows to the World for literature. Rounding out our studies we have The Story of the World and Mapping the World with Art for history and geography. TJ reads a chapter from The Story of the World and uses the corresponding tests as worksheets. The next day she works on her timeline - adding new dates and people, mapping, and she uses the outlining worksheets from the Activity Guide. To finish out the week she reads more about the topic and writes a short summary. For science we're continuing with the Apologia sequence. She works independently on this program - covering a module every two weeks. She reads and takes notes for six days and then takes two days to complete the study guide and take the test (using her notes as a reference). What does a day of homeschooling an eighth grader look like? Much like homeschooling any other age! The biggest differences that I’m noticing -- my usual early riser is starting to wake up later than usual (par for the course at this age) and we’ve had a few bouts of moodiness (also par for the course). But one of the bonuses of homeschooling this age is the independence. We still have our daily meeting time but much of the actual work is done independently. We start our day around 9 with our morning meeting. During that hour or two we go over assignments and work on a few subjects together (this year my focus is on writing skills so much of our meeting time is spent working on those skills). We also have a morning loop -- subjects we don’t cover everyday but I want to keep in the rotation: logic, poetry, geography, art. Those subjects are listed in my agenda and we just choose the next one on the list to work on, crossing them off as we go. After our morning meeting, my daughter works independently. She works on math, grammar, French, writing, and vocabulary until we break for lunch. After lunch she tackles science and history (which takes about an hour and a half) before we end our day with an hour for literature. With our dedicated daily schedule we are able to cover the bulk of our work four days a week - giving us an extra weekday for catching up on things that go unfinished or outside activities and errands. The one thing I’m noticing though, is that we need that dedicated school time to fit in everything on our 8th-grade homeschool schedule and have to save extra activities for later. Our school day takes more time at this age and I have to guard that daily time and keep outside commitments from creeping in. Get ready to organize your homeschool day with these free printable homeschool planning pages! We are having such a good homeschool year! Of course, it’s had its ups-and-downs but overall, I’m happy with the progress we’ve made. Thankfully, we’ve only had one failure this year - Breaking the French Barrier. It’s just a little beyond what my daughter can do on her own without coaxing through every worksheet. So we’ve switched to a few apps to continue practicing the basics and we’ll tackle Breaking the French Barrier next year. Most of our resources have been great - and there are some that deserve special attention. I can’t tell you how much we love the Writing & Rhetoric series (well, you could read my reviews of each level to get a taste of what I’m feeling) - it’s solid and dependable and my daughter actually enjoys it! Instead of the standard 5-paragraph essay, students are taught a variety of different types of essays that they'll be able to apply to any topic later on. It’s a much more interesting way of writing. If you need to add a bit of fun and creativity to your homeschool day you need to check out this program. 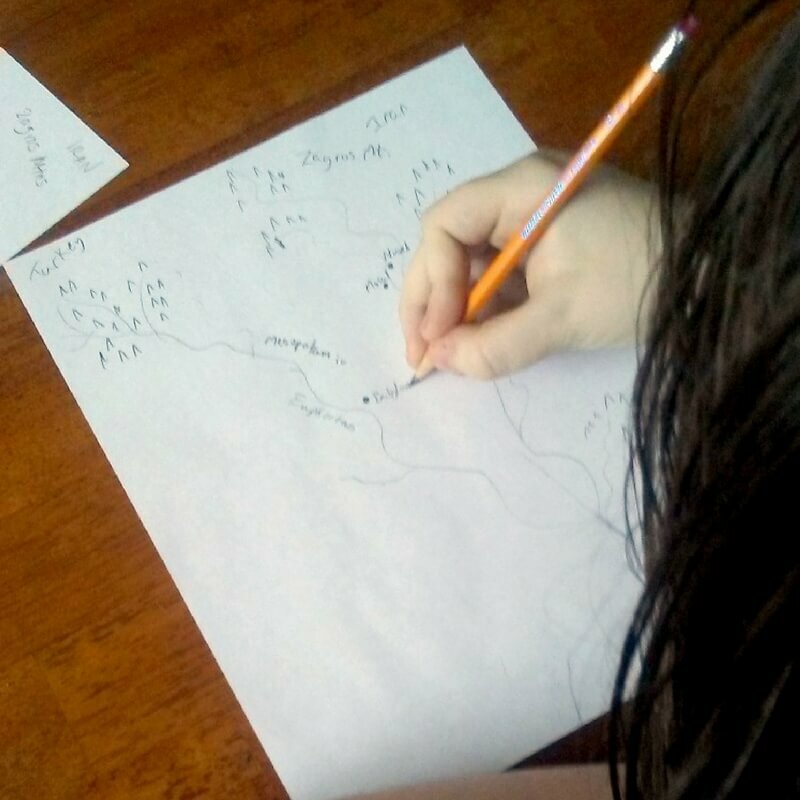 Mapping the World with Art will have you and your kids drawing your own maps of the whole world by the time you finish the series of lessons. There are short history readings, maps to draw (and videos to watch), and even plenty of hands-on activities to make it a fun, full program. Highly recommended for something a little fun and different. We’re using Teaching the Classics & Windows to the World for literature this year (with the expanded scope and sequence) - with a plan to take two years to cover the full program. We’ve added extra reading - Sherlock Holmes stories, Anne of Green Gables, and other novels. Each week we read and discuss stories and books, make story charts, and we’re learning to annotate our reading. We are truly in love with the logic materials from Classical Academic Press. We enjoyed The Art of Argument last year and we are happy to continue with The Discovery of Deduction this year. Last year was all about informal fallacies and now we’re kicking it up a notch and moving on to formal logic - learning about the structure of solid arguments. These junior high years are the perfect time to start preparing kids for high school level work. Working on note-taking, study skills, longer writing assignments, and getting them up to speed in math will serve them well for the upcoming years. I’d love to know about your experience homeschooling 8th grade. Leave a comment below and tell me what you think is the most important thing to teach before starting the high school years.